I AM A CHAPSTICK ADDICT! I LIKE THE BRAND CHAPSTICK BLACKLABEL. I NEED HELP & I THINK THESE COMPANIES KNOW ITS ADDICTIVE. I thought I was the only one addicted to Blistex DCT. I don’t know what they put in these little jars but it’s pure Heroin for the Lips. Once you start using it you are hooked. I actually stopped using for a bunch of years only to start again after a long airplane flight and having extremly dry chapped lips that were in heat. I finally landed and grabed some Carmex but that brand didn’t give me the same silky feeling of Blistex DCT does on my lips. I just ordered a 12 Pack on Amazon. They don’t even sell single jars anymore!! I’m actually greatful they stopped selling it at Walgreens because that’s when I originally stopped using. Now I’m using again.. Ordering more DCTat this very moment. Can’t get enough!!!! I could have written this post word for word, minus the trying to quit part. I actually found this site looking to buy more as I can’t find it anywhere anymore where I live…I’ve been addicted for 28 years now. I desperately want to stop, but don’t know how. I am quitting smoking, yet can’t quit my addiction to Blistex DCT, how sad is that?! I totally relate to all the other folks who talk about how wonderful DCT is! If only these stores knew how short-sighted they’re being by discontinuing this necessary product. I will not switch to another brand, I will find it wherever I need to. Cannot live without it! At age 47, I had never had cracked lips in my life so I met with my Dermatologist since no lip balm that I had tried was effective. My doctor said to try Blistex DCT which he sells in his office. It provided IMMEDIATE relief & my chapped lips were gone! I couldn’t believe it! I had tried about 7 different lip balms & this worked instantly! I now dip into the DCT “bowl” multiple times daily since I never want to experience the pain of chapped lips ever again. Thank you Blistex DCT for this miracle lip balm!! I’d like to know how much Blistix is in a tube?……don’t know how to measure it, but is the tube at least half the length of the container? It seems that I am down to the rim of it very soon. I also feel that this could be a post from me with just a change in products. The stash, the hoarding, going home to retrieve products. I can’t get in the car for a road trip without worrying that I have a lip product close enough to use the whole trip! I guess I’ve never thought about this as a real addiction before, about “using” lip balm like a drug. This site is opening my eyes. I’m also terrified about withdrawal but I am so ready to be done with this habit. Thank you for sharing! I only have about 4 or 5 pots left. I have looked all over my small town and haven’t been able to find it anymore. Guess I will have to order it online…I hate doing that, but gotta have it. I have tried one other brand but NO, have to have DCT. 51 year old male. lifetime addict, it started with chapstick at about age 8, when they took chapstick medicated ointment off the market…maybe 1995 or 1996…i bought like 10 of them…carmex will do in a pinch…but for the past 15 years or so it has been blistex lip medex in the blue ‘tub’ i think it’s the clove oil, or the sensation of the menthol feeling…. but yes, it is real…and it is real ridiculous… i have these little blue tubs EVERYWHERE….and i usually buy 2 or 3 at a time…rite aid sometimes has deals. they are my #1 dealer…and yes…this whole thing is driven by the industry…could be worse…you ever see what happens to a meth head’s teeth ????? guess i got off light…. now it’s wintertime and i just fly through this stuff. I’ve been searching our big town frantically for DCT and am so happy to hear I can buy 12 tubs on Amazon. I am 50 this year and have been addicted to this product since my teens. Now I have all five of my kids addicted. We cannot go to the beach without it and we are down to our last tub with summer only a few months away. Every time I drive by a new store that looks like it could sell DCT, I must stop and the kids know exactly why. I Googled it this morning, finally realizing I needed a higher help in my search and this site came up. Besides Amazon, it lists Bed, Barh, and Beyond as a “seller” so I will be hitting them up today (I hope they are open on Easter). It is so nice to know there are others like me! of scabs & “god awful dryness” but I’m hoping this is the last stage, BUT I will never give up!…even if it takes months! I’m so happy and proud of myself!! You can do it too!! For the past 40 years or so I was dependent upon lip balm. Have tried them all. Could get never get off. Then, 18 months ago, having liberally applied SPF 15 Blistik, after a day of golf in the Utah sun, the shower stream caused my lower lip to split. Yikes. Research led me to conclude that replacing one type of balm for another did not help. No specialty seemed to know the cause let alone the treatment. Not dentistry, otolaryngology, dermatology, plastic surgery. None. The consistent answer seemed to be “cold turkey” quitting. I had tried that before unsuccessfully. Further research unveiled that the epithelium needed at least 12 weeks, and possibly much longer because of the chronic and continuous use. I decided to give it 2 weeks per year of use. Hence, 18 months later, I report my experience that for the first 6 months it was hell. Splitting, bleeding, flaking. Then, improvement began. Even in the dry cold Utah winter during ski season, even during the ridiculously hot Florida sun. One year later, real improvement. Now, after 18 months, I rarely use Nivea cream on my lips. I clip off some flakes with a nail clipper. I am 80% improved. Will post again after another 18 months (summer of 2018) to let you know of my progress. So sorry you suffer from this too. Hope this helps. Good luck. i have a Major problem sometimes i duel wheel the sticks i sometimes try to use it as deodorant. its a struggle to live without it once my mom took my chap stick away and i threatened to kill myself. I am a musician, and DCT is the only lip balm that stays on for the entire concert / show / whatever. No stores carry it in my town anymore, so I also have to buy it online. And I’ve managed to convince several of my musician friends that they can’t do without it either. I haven’t had any for about a year - I’ve been using other Blistex brands, but I have to do the annoying thing and apply them multiple times a day - so it’s time to order more DCT!! I’ve been addicted to Blistex DCT for about 30 years now and I’ve tried other products when I couldn’t find Blistex DCT, however, I developed small pimples on my lips as soon as I tried other products such as their Medicated Blistex in the Navy Blue container. I don’t understand why it’s so hard to find Blistex DCT…I’ve been forced to order it online for years and finally, I found it limited at limited Bed Bath and Beyond locations. Rite-Aid carried it also and now I’m unable to find it anywhere. Back to my online sources. It’s like trying to purchase a controlled substance or something. It was much easier to find Carmex when I was addicted to their products. Seriously?? Addiction??? How about a serious need for sun protection from lips. 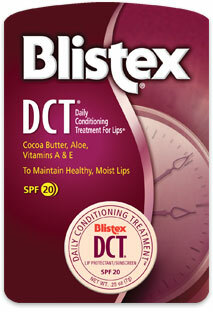 I get fever blisters if I don’t use sunscreen for my lips and Blistex DCT is the best out there. I recently purchased something else just to try, which has a higher SPF, and wound up with fever blisters after all. Its not too greasy or thick and its great under lipstick. I also realize that using too much of this is not good for your lips. The “experts” say your lips should not always be moist . A little dryness is good. So therefore I use it maintly when I’m going to be out in the sun for a prolonged period of time and this is the best product for that. I have had a 27 year addiction to lip balm and it got to the point recently where I was embarrassed to keep applying it (on first dates, new boyfriends, job interviews etc!! ), not to mention the marks left on glasses when drinking! I was looking at the smears on my glass yesterday morning and I decided enough was enough!! I gave up smoking 8 years ago which was the hardest thing in the world so I figured this can’t be as hard as that so I had all the motivation in the world and have gone cold turkey now for 31 hours!! I was going to quit gradually and use it every hour but after 15 minutes of applying some, i realised the whole 45 minutes of the hour was uncomfortable and spent longing for the next application so may as well make the whole hour uncomfortable and just get it done as quickly as possible. Also it’s never going to get any dryer than the first few hours so I figured if i can cope with that, I can cope with days/weeks like this. I’ve not had any peeling…YET!! I am putting a small amount of coconut oil on after brushing my teeth morning and evening as that is when it’s the worst and hopefully it will just ease off any peeling. Drinking water is helpful and just thinking about being free from the constrains of having to have it every waking moment!! Also do not have it anywhere nearby as many times I would have applied it though sheer habit had it been to hand!